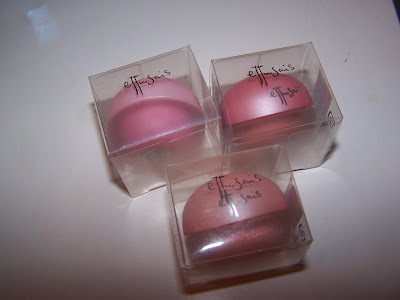 My obsession with Ettusais continues with a review of these interesting little mousse blushes that I picked up! I don’t like these but I won’t give them a bad review because they are actually great yet a bit too natural for me. First of all the packaging is ultra cute and I believe that’s what sold me on these. They come in a tiny glass jar with a cute screw top! Awww! Packaging really sells me on a product and in this case I had to have these as they were so yummie looking! 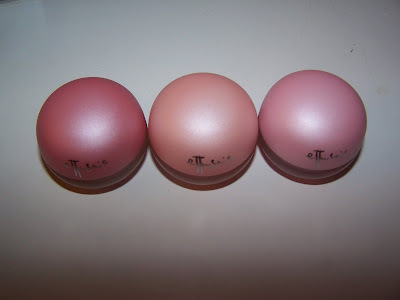 A few US companies do a similar style blush such as Clinique’s Touch Blush. These have the feel of a silky mousse. It’s very light and airy! Application is a breeze as these blend on perfectly and sink into the skin practically on contact! The color selections I got were a dark bronze peach, a cooler, lighter peach, and a natural pink. Here in lays part of my dislike of the blushes, they go on very sheer and give me a beautiful glow of color but it’s a bit too natural for me. 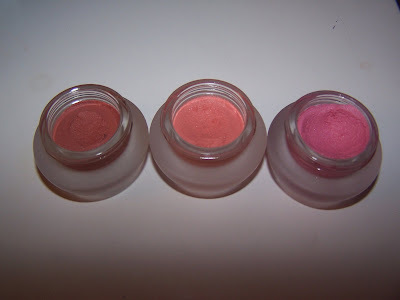 I like blush that’s vibrant and these just give me more of a natural, I’m not wearing any blush flush. All in all they are very cute and are interesting to use but I just can’t love them! They are looking for a new home 😉 If anyone is interested shoot me an e-mail! O la la, i think i can easily say i like what i see. Do they sell these in the UK by any chance? hahah. i couldnt resist commenting how cute they are first. wennnnn where ya been gorgeous? I noticed they aren’t on the site either! I looked through the china site and japan one and no joy! If you’re interested I’m selling ’em off because they just aren’t working for me! They are off to the bin to be swapped or sold off if you are interested just yell! Oh, they are pretty blushes, at least they are pretty in the little pots. How much are you selling them for? very cute! the tops look like candy..! ohh.. i used to have them! they’re really good. but its off to the bin when i switched to mineral makeup. ooh these look pretty 🙂 are these shimmery or matte? Been wanting to try those, so you say they give a sheer touch, i would love something that impart a natural blush for me but i don’t want a sheer colour hhehe, i love the clinique touch blush though :). got your email lady 😉 Thanks! I’ll mail you back soonish! I’ll rec too! I have to tell ya something anyway and also tell you about your awesome review you sent me! I was looking for a bit less then I paid. So far I think two are spoken for 😉 but email me! Is wearing creams a bit hard with mineral foundation? Was always curious. I thought maybe you could wear your stain or cream under the mineral foundation! You know how I love me some shimmer! OH, question! i tried really hard to steer clear of MAC since the Fafi release because I didn’t want to spend my money, but I happened to be passing by a MAC freestanding store with my friend, and i couldn’t resist. I stopped myself from going Fafi-insane, though. I just picked up a beauty powder in verve-acious and a medium clear makeup bag. LOVING HOW ITS CLEAR! how do you use your beauty powders? do you use it for an all-over glow? Thanks! I have a bit of a wait list right now but will email you and add you on as I haven’t heard back from everyone in regards to payment and such! YAY FAFI LOVE!!!!!!! I normally use the powders as a highlighter on my cheek bones. I just smile bright and apply to my cheek bones. But you can use it anywhere really. As a base for your shadows, on your shoulders and cleavage, on your cheeks, as a highlighter etc…!